Dimensions 0.90 by 5.30 by 8.20 in. As a boy, Robert D. Kaplan listened to his truck-driver father tell evocative stories about traveling across America in his youth, travels in which he learned to understand the country literally from the ground up. There was a specific phrase from Kaplanâs childhood that captured this perspective: A westward traveler must âearn the Rockiesâ by drivingânot flyingâacross the flat Midwest and Great Plains. 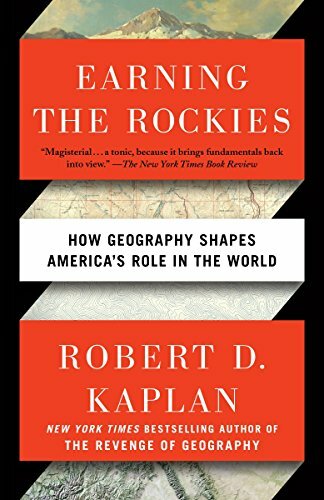 In Earning the Rockies, Kaplan undertakes his own cross-country journey to recapture an appreciation of American geography often lost in the jet age. Traveling west, in the same direction as the pioneers, Kaplan traverses a rich and varied landscape that remains the primary source of American power. Along the way, he witnesses both prosperity and declineâincreasingly cosmopolitan cities that thrive on globalization, impoverished towns denuded by the loss of manufacturingâand paints a bracingly clear picture of America today. The history of westward expansion is examined here in a new lightâas a story not just of genocide and individualism, but also of communalism and a respect for the limits of a water-starved terrain, a frontier experience that bent our national character toward pragmatism. Kaplan shows how the great midcentury works of geography and geopolitics by Bernard DeVoto, Walter Prescott Webb, and Wallace Stegner are more relevant today than ever before. Concluding his journey at Naval Base San Diego, Kaplan looks out across the Pacific Ocean to the next frontier: China, India, and the emerging nations of Asia. And in the final chapter, he provides a gripping description of an anarchic world and explains why Americaâs foreign policy response ought to be rooted in its own geographical situation. In this short, intense meditation on the American landscape, Robert D. Kaplan reminds us of an overlooked source of American strength: the fact that we are a nation, empire, and continent all at once. Earning the Rockies is an urgent reminder of how a nationâs geography still foreshadows its future, and how we must reexamine our own landscape in order to confront the challenges that lie before us.